While you may have never before considered entering the "multi-sport world" before, you’re now ready to do so! Having first completed a 1-mile run and then a 5K race (woo-hoo! ), you’re well on your way to earning your “endurance athlete” badge. Sure, a triathlon -- which combines swimming, biking, and running -- sounds like something only experienced sporty folk would do, but it’s not as out of reach as you may think. A sprint triathlon -- which features shorter distances of each sport than a full or Olympic triathlon -- is a great place to start multi-sport competition. Distances vary, but generally speaking, in a sprint triathlon you'll swim .5 miles; bike 12.4 miles; and run 3.1 miles (a 5K). So you obviously need to train for all three sports, and also learn how to move from one section of the race to the next smoothly and quickly (what are called "transitions"). The best part of training for a sprint triathlon is the fact that you get to hone your skills in three different disciplines. This will keep you from getting bored, but it also allows you to bump up the time you train each week without getting injured. Training in three sports, rather than one, means you’ll be using different muscles each day, thereby avoiding overworking the same areas, which can lead to injury. By mixing things up, you’ll find you get in shape faster while noticing less that you’re actually putting in more minutes of exercise. 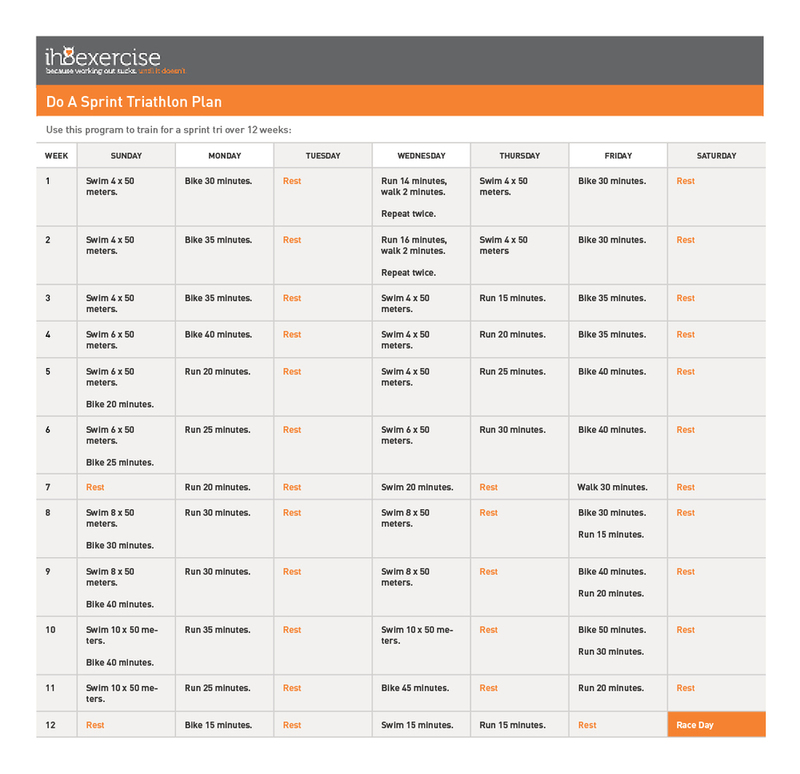 To print the Complete a Sprint Triathlon Training Plan, click here. You did it! You reached the finish line. Spend the two weeks after your race doing only casual exercise--nothing strenuous--to allow your body to recover. Then get back on the workout train and consider signing up for an Olympic-distance triathlon, which is a .93-mile swim, a 25-mile bike ride, and a 6.2-mile run. Who knows, maybe one day you’ll even be able to call yourself an Ironman, an epic race that includes a 2.4-mile swim, 112-mile bike ride, and a 26.2-mile run (a full marathon).